2 tablespoons of apricot jam. Stretch the pastry and lay it in a nonstick tart pan of 25cm after oiling it very lightly. Boil the milk with the removed seeds of vanilla. You can add the remaining vanilla as well but do not forget the take the beans out before going to the next step. In a bowl, mix the egg yolks with sugar until they become more white. Pour the hot milk in the egg yolks mixing continuously. Put back the composition in the milk pan and heat it mixing without stop until it becomes thick. Remove from the heat, cover with plastic foil and let it cool for 15 minutes. When colder, put it on the bottom of the tart pan, over the shortcrust pastry. Slice the apples and sprinkle them with lemon to avoid darkening. Lay the slices of apples over the creme. Dissolve the 2 tablespoons of apricot jam in 40ml of water until it becomes more liquid. Brush with it the apples on the top of the tart to avoid drying and browning. 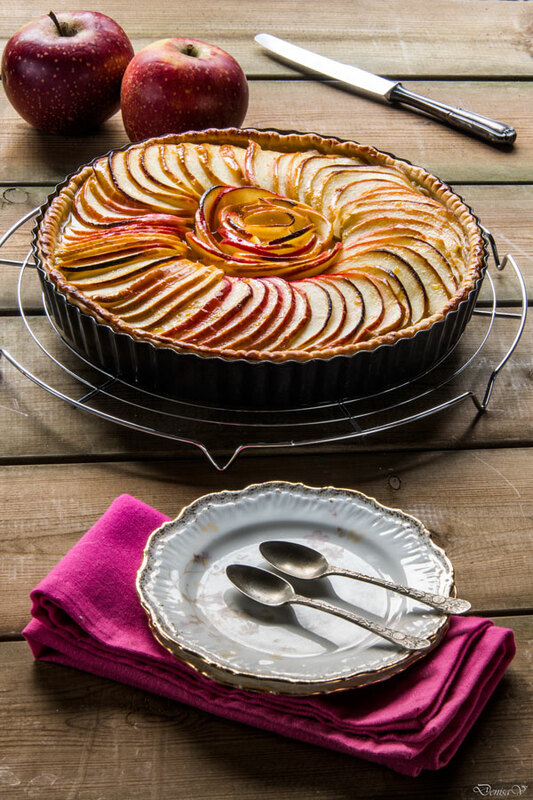 Bake the tart in the preheated oven at 220ºC for 30 minutes covering the it with aluminum foil to avoid burning the apples. Remove the aluminum foil and continue to bake for 15-20 minutes. Inspired from Cuisine de copains - October 2013, page 98.